I dialed Jenny’s number, curious as to what she would say. Soon, I discovered I had nothing to worry about. Jenny was a pleasant young lady and was intrigued by the possibility that her grandfather or grand uncle, Will or Jim Smith, could be Jane’s father. She told me what a great man her grandfather had been. He had moved to California and married her grandmother there by 1950. Jenny and I came up with a plan: she would buy a DNA kit for her father, Todd, to take and send in to Ancestry. His results would help us determine if Will or Jim was the father. A few days later, I received a call from Angie, Jenny’s cousin. Her mother, Cathy, was Todd’s sister. Angie had talked to Jenny and was equally as excited to solve the puzzle of Jane’s father. Jane was obviously related to their family, we just didn’t know how yet. We impatiently waited for a month or more for Todd’s test results to come back. I finally received a call from Jenny. They were here! I quickly checked Jane’s DNA profile on Ancestry. Darn! The numbers weren’t conclusive. Todd’s DNA matched Jane’s but was in the very low range for a half-sibling, and the high range for a first cousin. Back to the drawing board. After lengthy discussions with Jenny and Angie, we decided to get ahold of the other brother, Jim’s, daughter and see if she would take a DNA test. She readily agreed. Another month or more wait. Her results finally came in…she matched as a definite first cousin (she was actually disappointed she didn’t match as a half-sister). So, we could rule out Jim as the father. More discussions with Jenny and Angie. Angie decided to convince her mom, Diane, Todd’s sister into taking the DNA test. She agreed. Here we were again: order the kit, spit into the tube, send it in, and wait. Finally the day arrived. The test results came back. Diane’s DNA came back with a 95% probability of being a half-sibling to Jane! Coincidently, it was Jane’s 70th birthday that day. What a great birthday present. With Todd’s, Cathy’s, Angie’s, Jenny’s and now Diane’s DNA results, plus the genealogy research and tree I had constructed, we could confidently say that Will Smith was Jane’s father. We’ll never now if he knew, or what the story was about how he met Jane’s mother. However, we found a family who opened their arms and accepted Jane based on the DNA and genealogy research. Not all stories like this have a happy ending, but fortunately, this one did. Jane and I sat around my dining room table discussing her story. We came up with a plan. Top on the list was for Jane to take a DNA test. I opened up my laptop and immediately ordered it from Ancestry. It arrived the next week. Jane came over, spit in the test tube, and mailed the sample that same day. As we waited for the sample to be analyzed, I did some research. 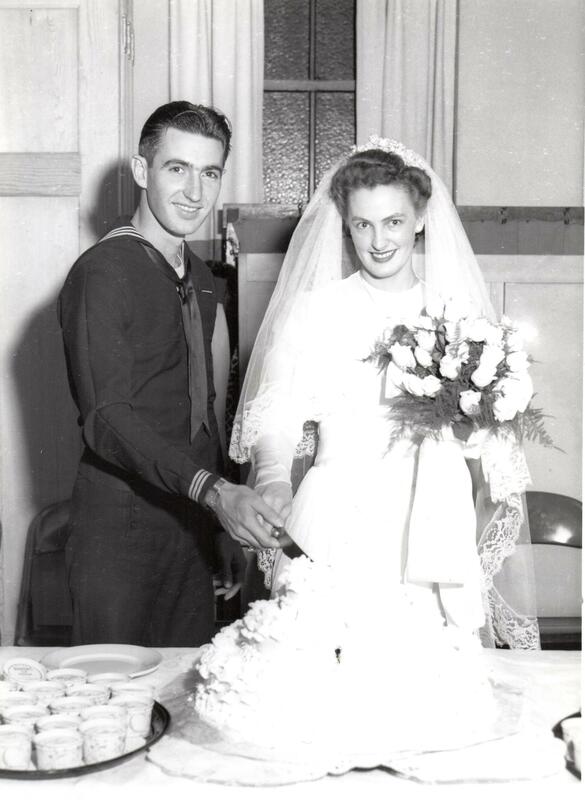 John Jones and Jane’s mother were married in April of 1948 and Jane was born in November of 1948. Yes, she was pregnant when they got married. They divorced within a few months after Jane was born. It all started at a church picnic. We were sitting around the picnic table delighting in our desserts, when a gentleman asked if I was still doing genealogy and how it was going. Always eager to talk about my genealogy pursuits, I gave a brief overview of my activities. Soon a voice piped up from down at the end of the table, “Could you help me find my dad”? Without missing a beat I responded with a “Sure, I’d love to”! Soon the two of us embarked on a journey to find Jane’s elusive father. Later that week, sitting around my dining room table, Jane indicated that at age 70 she felt she deserved to know the truth. It started for her around age 13 when she was looking at her baby book and noticed a different last name on some of the documents. Jane asked her mother about this and found out that the man she knew and loved as Dad had adopted her as a baby. Her mother then divulged that she had been married previously, when Jane was born, to a man we will call John Jones. Jane grew up never meeting this man, and loving and cherishing the man she knew as Dad. When Jane was in her late fifties, she decided she wanted to get a copy of her original birth certificate, not her adopted one. In our state, the laws require the signatures of both parents, if living, or their death certificates. Jane obtained the proper forms and researched and found that John Jones was still living. She approached her mother about signing the forms, but her mother refused. Sometime through the years, the rumor had floated around that Dave Brown, rather than John Jones, was Jane’s father. Her mother would divulge nothing. Several years later, after Jane’s mother passed away, Jane decided to pursue obtaining the original birth certificate again, this time with her mother’s death certificate instead of her signature. She looked up John Jones, explained what she wanted, and asked if he would sign the forms for her. Yes, he would. Jane visited him at his house, he signed the forms and they chatted a bit. Jane found out that John and her mother were only married a brief time, and that things just didn’t work out for them. Then, out of the blue, John asked Jane if she would be willing to take a paternity test. Of course her answer was yes! A short time later the results came back…John was NOT Jane’s father. Who was Jane’s father then? St. Louis here we come! Tomorrow morning my friend, Cookie and I, leave for the NGS conference in St. Charles, Missouri. I am excited beyond words. I have attended national conferences in the past, and know what to look forward to in the coming week. Genealogy overload!! Four days for lectures, exhibitors, and talking genealogy with my friends (new and old). Today is packing day. Lots of comfy, business casual clothes and comfortable shoes. I won’t forget my swimsuit so I can sit in the whirlpool at the end of the day. Loaded up with business cards, iPad with conference app and syllabus downloaded, extra cash to buy books, etc. Lots of things to remember. One other thing to get excited about…I get to see one of my old college friends who lives in St. Louis. We are planning dinner on Wednesday evening, and time visiting at her house on Saturday evening. I am so looking forward to seeing Karen! The engagement and approaching marriage of their daughter, Miss Corinne Joy Johnson, was announced Sunday at a buffet dinner by Mr. and Mrs. Sigurd P. Johnson. 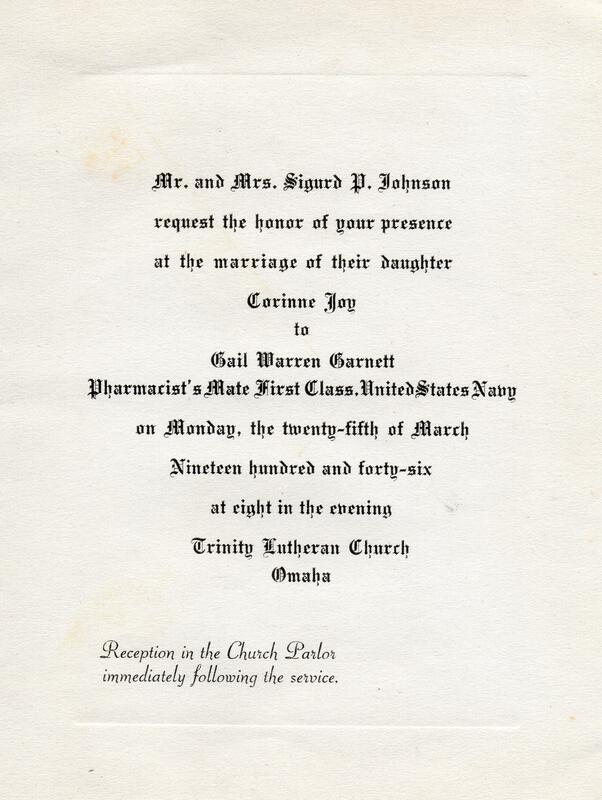 Miss Johnson’s fiance is PhM1C Gail W. Garnett, son of Mrs. Grace Garnett. The couple will be married Monday at 8 p.m. at Trinity Lutheran Chruch. 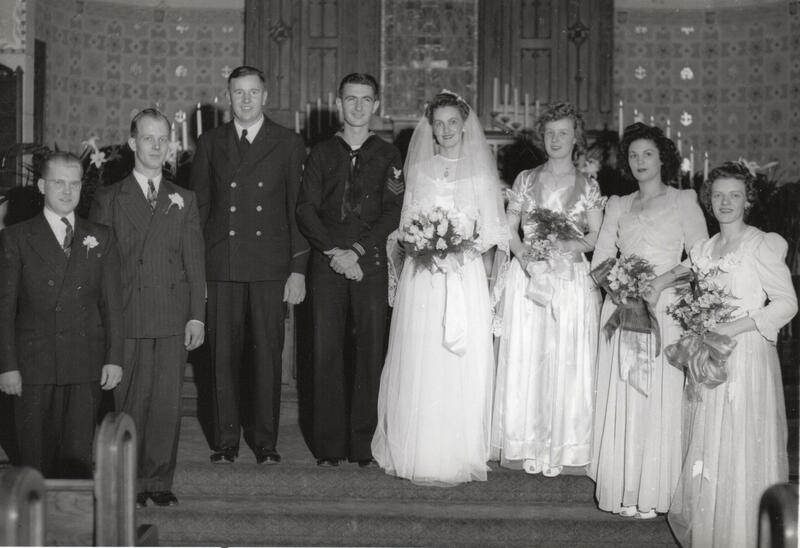 The Wedding Party – Bob Schiller, Keith Johnson, Tony Jacobson, Gail, Corinne, Missy Johnson, Ann Madsen, Lois Johnson. The following is a poem written by my great grandmother, Virginia (Jenny) Coate Harper. I thought it was very fitting for this beautiful Midwestern spring day. To fill our hearts with cheer. Will vie for scent and grace. For crops this earth will yield. Must love the happy spring. Jenny was born on 21 Mar 1874 to Calvin W. and Candace (Coppock) Coate. She married Elbert S. Harper on 22 Dec 1902. Jenny died on 28 Sep 1950. Much of her poetry was discovered years after her death, mixed among personal papers and possessions. Many of these poems were written on the backs of used envelopes, old letters, or scraps of paper. In the 1990’s, Jenny’s granddaughter, Betty, self-published a small collections of Jenny’s poetry to preserve it for future generations. Schwartman, Betty (Taylor) Smith, Ed., Jenny: A Portrait in Poetry. 199?, self-published. Today is day 2 of the Nebraska State Genealogical Society’s 38th Annual Conference in Grand Island. Yesterday we had several great session from George Morgan of Aha!Seminars. “The Genealogist as CSI” was a refreshing view of genealogy research from a different perspective. We look for clues, gather evidence, evaluate the evidence, develop hypotheses, and reach conclusions just like crime scene investigators do. George also spoke about using maps to further our genealogy research, as well as locating and analyzing obituaries for more clues. The sessions also included a panel discussion from several lineage societies, including Daughters of the American Revolution (DAR), Colonial Dames, The Society of Mayflower Descendents, and Union Daughters of the Civil War. Although I am already a member of DAR, I really think I should talk to a few friends about joining Colonial Dames, and Union Daughters. Both sound like worthwhile organizations. Alas, I do not qualify for the Mayflower Society. Darn. Today we look forward to more lectures from George on using the U.S. Agricultural Census Schedules, and gleaning clues from newspapers. We also have on the schedule, Kassie Nelson speaking on Handing Down History to the next generation, and a panel discussion on Genealogical Computer Programs (Legacy, RootsMagic, FamilyTreeMaker). I can’t wait for another great day of communing with my genealogy friends and colleagues. Often times as genealogists, we utilize tombstones as sources of data for the birth and death information on our ancestors. Being able to see a gravestone (or a picture) can open up doors for discovery that we, as genealogists, often dream about. Perhaps it might be the foreign place of birth, military history, or groups to which our ancestor belonged. However, in my case, it was a small piece of history immortalized for all time. During the mid-1840s, Hancock County, Illinois, and the city of Nauvoo, became an area of settlement for the Latter Day Saints, as they were driven farther and farther westward. 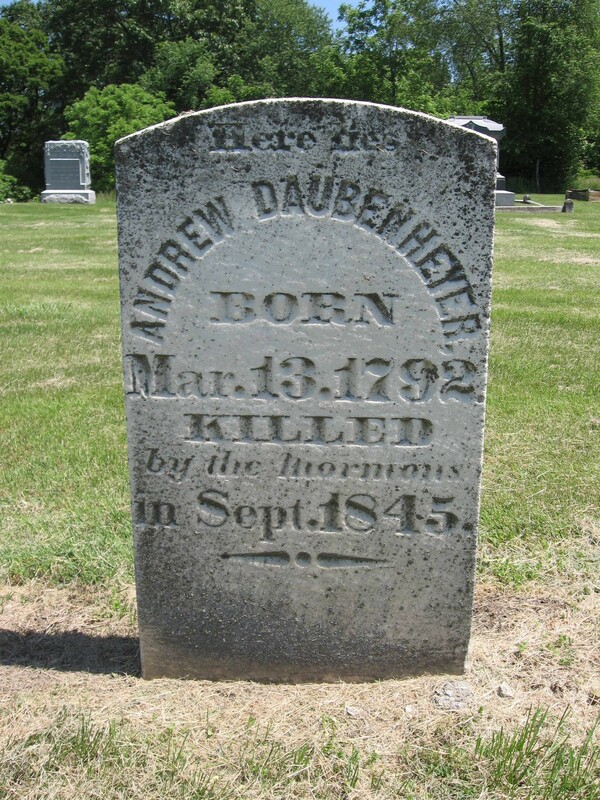 Andrew Daubenheyer, one of the local settlers in the area, like many of his friends and neighbors, was displeased with the settlement of the Mormans. This lead to a tumultuous time in Hancock County history. 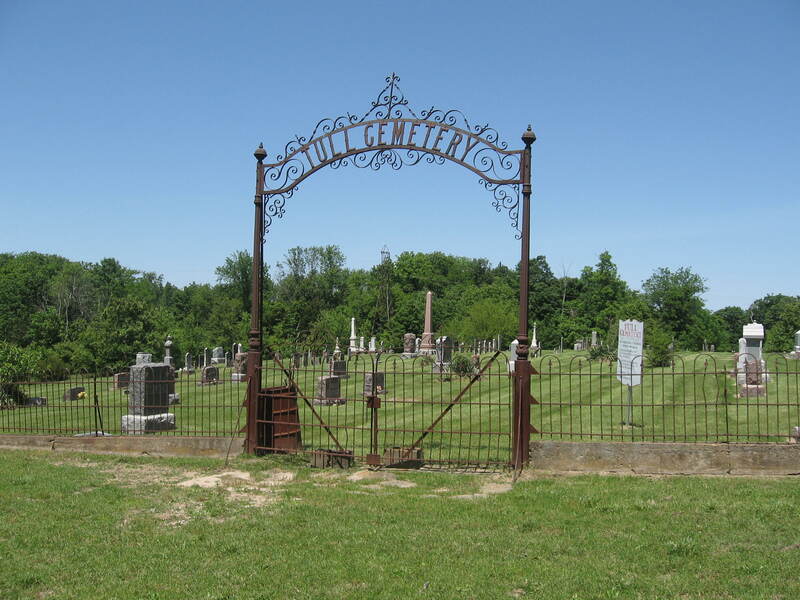 A couple of years ago, I had the opportunity to visit Tull Cemetery in Hancock County, where Andrew and his wife, Jerusha, are buried. High on a hill, overlooking the Mississippi River, stands a wonderful tombstone that hints at a history of its own. Gregg, History of Hancock County (1880), p. 344. 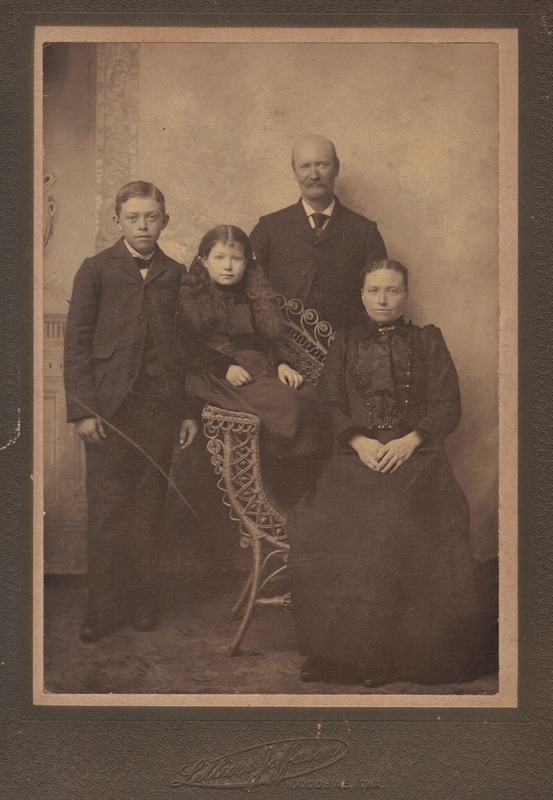 William H. and Ricca (Nelk) Harper, Cecil and Bessie, circa 1896-98. Several years ago, I received some photos and newspaper clippings of the William H. Harper family from relatives at the Harper-Hunt family reunion, as this line of the family no longer had any living descendants. William H. Harper was the oldest son of John K. and Eliza J. (Hunt) Harper. As I perused the materials given to me, a tragic tale unfolded. Bessie Harper was born 10 July 1893 near Woodbine, Iowa, the daughter of William H. Harper and Ricca Nelk. She was my maternal grandmother’s (Amy Harper Taylor) cousin. Bessie Harper became the bride of Herman Slayback on Wednesday, December 19, 1917 at 12 o’clock at the home of her parents, Willie and Ricca Harper, with about 150 guests in attendance. Her bridal gown was pale blue silk with a veil of white net held in place by lilies of the valley. She was attended by her cousin, Creola Burch, who wore white silk. Both young ladies carried white roses. Bennie Grinnell acted as Herman’s groomsman. A reception was held the following evening at the home of the groom’s mother, Mrs. D. W. Dunkle. 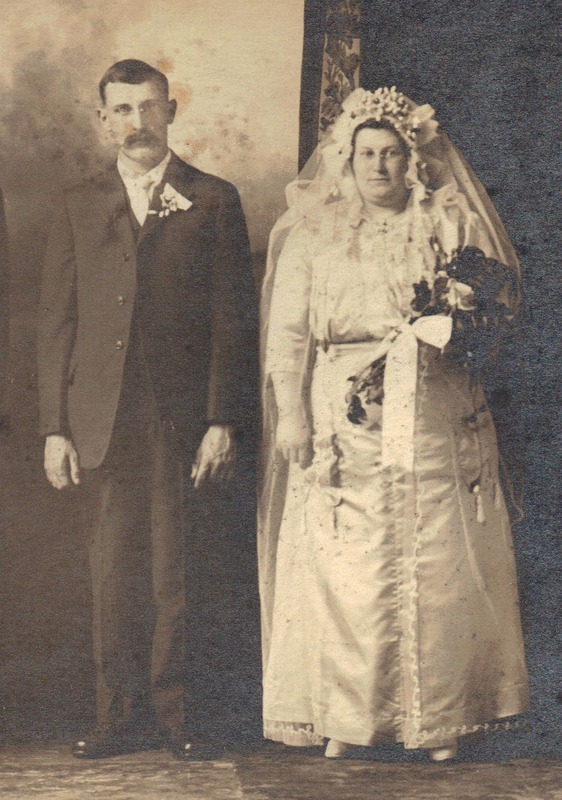 Herman Slayback and Bessie Harper, Wedding Day, 19 Dec 1917. Within the next few months, Bessie and Herman made their home in his hometown of Bloomfield, Nebraska. Less than ten months after their wedding, the newlyweds would both become victims of one of history’s darkest moments – the Influenza Epidemic of 1918. Harper-Hunt Family Records, submitted by family members at the Harper-Hunt family reunions, Woodbine, Iowa, 1978-1980. Unidentified original newspaper clipping, “Harper-Slayback”, obtained from family members, July 2000. Unidentified original newspaper clipping, “Mr. and Mrs. Herman Slayback”, dated 24 Oct 1918, obtained from family members, July 2000. I was playing around with the Omaha World Herald archives at the Omaha Public Library website yesterday. Lo and behold I found several articles on my father-in-law, Gail Garnett! 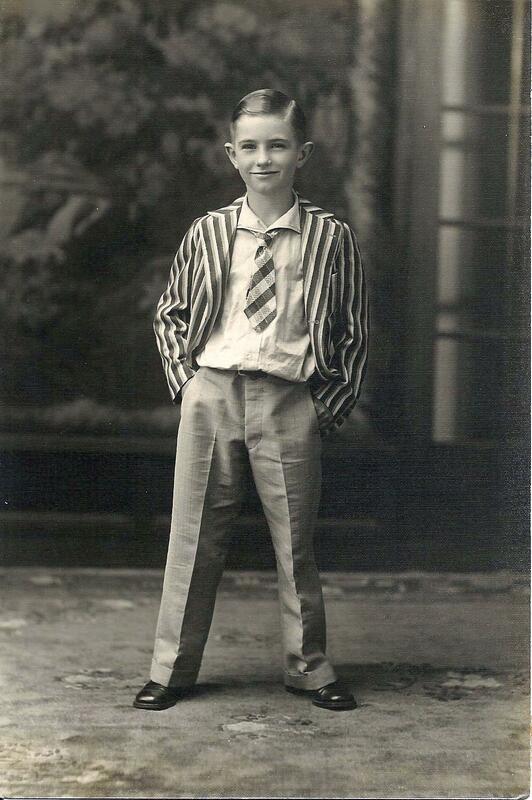 There were quite a few snippets about his “track star” days at Omaha Technical High School in 1940 and 1941. However, this one actually has a picture of him! OWHJuly1941b: (Omaha World-Herald, 6 Jul 1941, p. 3-B, Col. 1). And another one with a picture of Gail in his Navy uniform: OWHMar1942 (Omaha World-Herald, 29 Mar 1942, p. 4-B, Col. 1). One more of Gail and Corinne in Omaha on a visit: OWHJuly1951 (Omaha World-Herald, Evening Edition, 13 July 1951, p. 18, Col. 2). What great finds! I’ll have to see if I can obtain copies of the photos from the OWH archives.